Welcome to Moose Hollow 512! Whether you are looking for a rental in the center of all the action, or you want a place to kick back and relax, Moose Hollow 104 has exactly what you are looking for! With close proximity to the community pool and hot tub complex, easy access to Powder Mountain Resort and Pineview Reservoir, and some of the best views Utah has to offer, you are sure to enjoy your mountain getaway in this stunning condo. Bedroom 2: 1 Kind bed with ensuite bathroom. Bedroom 3: 1 Queen bed with full hallway bathroom. 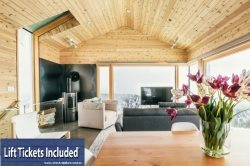 We are truly excited and honored to share our homes with each and every guest and we invite you to stay with us at Powder Mountain Getaways - MH512!